Seabury Hall recorded a pair of girls cross country team and individual victories Saturday, with its top runners taking first place at the Punahou Invitational on Oahu — led by reigning state champion Veronica Winham — and Maile Dougherty winning as part of a perfect team score at Maui Interscholastic League Meet No. 4 at King Kekau­like in Pukalani. At the Punahou meet, the Spartans finished with 47 points, and the Buffanblu were second with 54 — those teams won the Division II and Division I state team titles last season, although Seabury beat Punahou in unofficial overall scoring. Seabury’s Kallalei Ryden placed fourth on Saturday, Darby Mulligan was 13th, Chloe Gangnath was 14th and Erika Preseault was 15th. Last month at the Iolani Invitational on Oahu, Winham was the top Hawaii finisher and second overall to California’s Evie Cant. 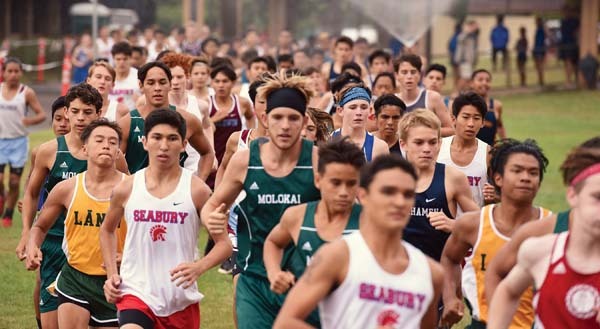 Sea­bury was fourth in the team standings, and had the second-best score among Hawaii schools, behind second-place Punahou. The Maui High boys finished third on Saturday. 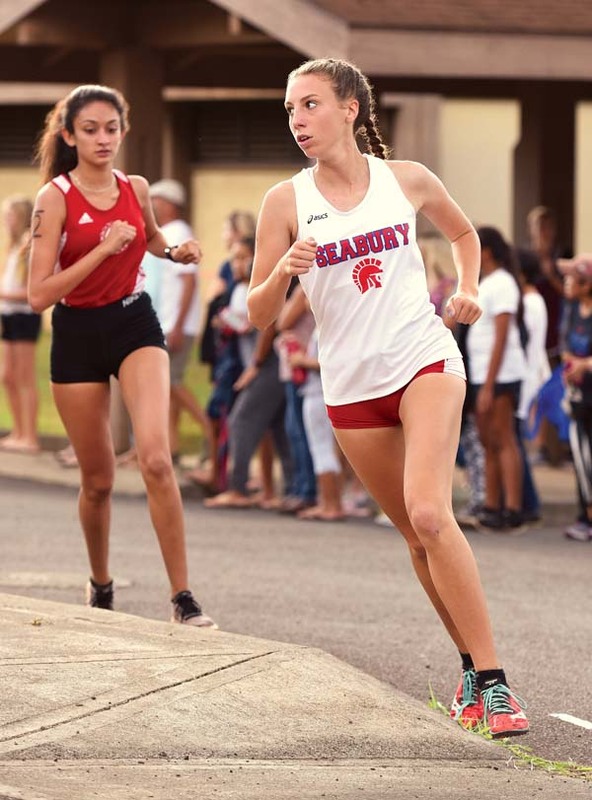 On Maui, Dougherty had a time of 22 minutes, 11 seconds, and Kalea Acevedo of Lahainaluna — which did not field a full team — was second in 22:27. Seabury’s Elizabeth Thibaudeau (22:30) was third. Maui Prep’s Ava Roberts, also competing individually, was fourth in 22:49, and was followed by three Seabury runners — Bella Lallo, who finished in 22:57, Elly Swartz, who was another second behind, and Ameera Waterford (23:02). Seabury has recorded a perfect team score four times this year. Baldwin was the D-I team runner-up with 62 points. The Bears’ Julia Knowles was 12th in 23:41. Lanai, competing as the lone D-II team, had 149 points. Micah Manuel was 16th in 23:51. 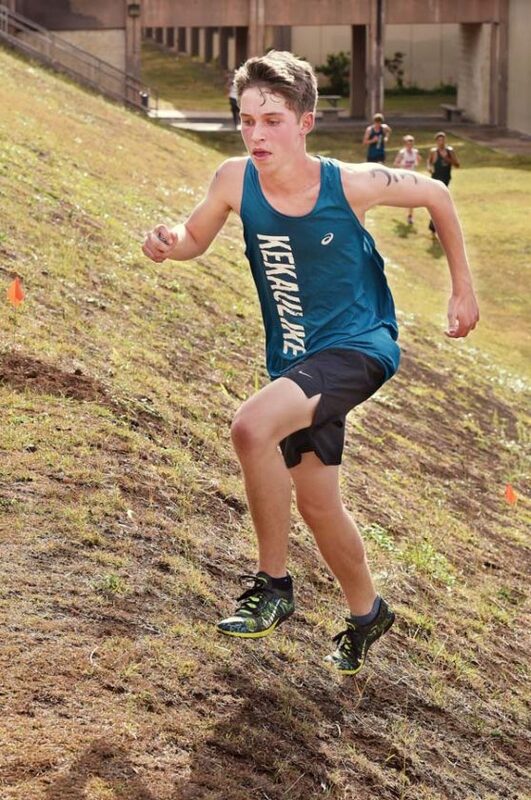 Griffin Hardy won the boys race in 18:50, leading King Kekaulike to a first-place team score of 30 points. Maui Prep’s Damon Wakefield was the runner-up, seven seconds behind, and Kihei Charter’s Gian Santiensanio was third in 18:58. Kamehameha Maui was second in the boys team standings with 86 points. The Warriors’ top finisher was Cy Ornellas, who placed sixth in 19:18. Seabury, which got a fourth-place finish from Jonathan Merchant (19:02) was the D-II team winner with 64 points. Molokai was second with 126. The Farmers’ Caele Manley finished 10th in 19:31. Division I–1. Seabury Hall 15, 2. Baldwin 62, 3. King Kekaulike 68, 4. Kamehameha Maui 104, 5. Maui High 118. 1. Maile Dougherty, Seabury Hall, 22:11; 2. Kalea Acevedo, Lahainaluna, 22:27; 3. Elizabeth Thibaudeau, Seabury Hall, 22:30; 4. Ava Roberts, Maui Prep, 22:49; 5. Bella Lallo, Seabury Hall, 22:57; 6. Elly Swartz, Seabury Hall, 22:58; 7. Ameera Waterford, Seabury Hall, 23:02; 8. Skyler Sands, King Kekaulike, 23:05; 9. Linn Huettmeyer, Maui Prep, 23:06; 10. Kira Caterina, Seabury Hall, 23:18; 11. Olivia Bozich, Maui Prep, 23:37; 12. Julia Knowles, Baldwin, 23:41; 13. Erin Kobashigawa, Baldwin, 23:48; 14. Kassie Inouye, Baldwin, 23:49; 15. Mia Daly, King Kekaulike, 23:50; 16. Micah Manuel, Lanai, 23:51; 17. Nyasia Martinez, King Kekaulike, 24:04; 18. Angel Dela Cruz, St. Anthony, 24:05; 19. Sara Salaparuta, Kihei Charter, 24:17; 21. Trinity Fox, Maui High, 24:22; 21. Naomi Takakura, Baldwin, 24:30; 23. Ashley Taoka, Maui High, 24:34; 23. Alyson Panglao, King Kekaulike, 24:38; 24. Ashley Nielson, Maui Prep, 24:42; 25. Lily Gavagan, Kamehameha Maui, 24:47; 26. Raelynn Yoshida, Kamehameha Maui, 25:12; 27. Isabella Theobald, Lahainaluna, 25:19; 28. Lily McLeod, Seabury Hall, 25:28; 29. Kelsie Sparks, Seabury Hall, 25:32; 30. Kahea Poepoe, Kamehameha Maui, 25:33; 31. Lilia Wietecha-Davis, Kamehameha Maui, 25:34; 32. Cassidy Matsuda, Maui High, 25:56; 33. Alysha Fontanilla, Baldwin, 25:57; 34. Kaya Dugan, King Kekaulike, 26:03; 35. Keely Logan, Kamehameha Maui, 26:11; 36. Celina Romero, Lanai, 26:33; 37. Nida Bergoust, Maui High, 26:39; 38. Hailey Knowles, Baldwin, 26:43; 39. Jasmine Molina, Lanai, 26:50; 40. 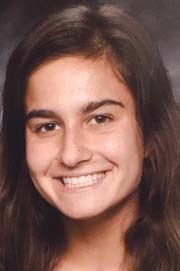 Rebecca Segura, Lahainaluna, 26:51; 41. Amy Joy Schmitt, Baldwin, 26:52; 42. Sophia Horovitz, Seabury Hall, 27:04; 43. Mindy Kimura, Baldwin, 27:08; 44. Avtalya Glickman, Kihei Charter, 27:14; 45. Macaleigh Hendricks, Kihei Charter, 27:27; 46. Kahiau Bonacorsi, Kamehameha Maui, 27:29; 47. Kiana Over, Kamehameha Maui, 27:43; 48. Sheilah Agcaoili, Lanai, 27:49; 49. Sarah Fusato, King Kekaulike, 27:52; 50. Sydnie Matsuda, Maui High, 27:58; 51. Sienna Bigelow, Seabury Hall, 28:18; 52. Jaelyne Navarro, Kamehameha Maui, 28:19; 53. Jaden Viloria, Baldwin, 28:20; 54. Ella Mitnick, Baldwin, 28:22; 55. Naomi Maeda, Maui High, 28:23; 56. Mykaela Padron, Baldwin, 28:28; 57. Mary Claire Manuel, Lanai, 28:40; 58. Destynee Albiar, Kamehameha Maui, 28:49; 59. Erin Ong, Baldwin, 28:54; 60. Sofia Andaluz, Kihei Charter, 29:13; 61. Erin Mukai, Baldwin, 29:14; 62. Britney Bautista, Maui High, 29:20; 63. Sokha Furumoto, St. Anthony, 31:25; 64. Kalei Eldredge, Baldwin, 31:50; 65. Vanessa Gabriel, St. Anthony, 32:31. Division I–1. King Kekaulike 30, 2. Kamehameha Maui 86, 3. Baldwin 123, 4. Maui High 170. Division II–1. Seabury Hall 64, 2. Molokai 126, 3. Lanai 241, 4. Kihei Charter 247. 1. Griffin Hardy, King Kekaulike, 18:50; 2. Damon Wakefield, Maui Prep, 18:57; 3. Gian Santiensanio, Kihei Charter, 18:58; 4. Jonathan Merchant, Seabury Hall, 19:02; 5. Ansel Newman, King Kekaulike, 19:15; 6. Cy Ornellas, Kamehameha Maui, 19:18; 7. Louie Smith, Seabury Hall, 19:19; 8. Marcus Kamakaiwi, King Kekaulike, 19:20; 9. Alexander Fahland, King Kekaulike, 19:27; 10. Caele Manley, Molokai, 19:31; 11. Kanai O’Connor, King Kekaulike, 19:36; 12. Kolbe Fontanilla, Baldwin, 19:37; 13. Nicholas Stevenson, King Kekaulike, 19:39; 14. Conan Gentil, Seabury Hall, 19:40; 15. Richard Haney, Kamehameha Maui, 19:44; 16. Gabe Frampton, Seabury Hall, 19:47; 17. Joey Musto, King Kekaulike, 19:52; 18. Jeremy Rivera, King Kekaulike, 19:55; 19. Cy Tamanaha, Baldwin, 19:58; 20. Gideon Aiwohi, Kamehameha Maui, 20:02; 21. Pukonakona Patricio, Kamehameha Maui, 20:04; 22. Alex Hamamura, Baldwin, 20:07; 23. Micah Ban, Maui High, 20:08; 24. Jesse Welling, King Kekaulike, 20:18; 25. Hezekiah Pacheco, Maui High, 20:19; 26. Kaina Adolpho, Molokai, 20:24; 27. Robert Mawae, Molokai, 20:28; 28. Innes Asher, Seabury Hall, 20:38; 29. Garrett Smith, Kamehameha Maui, 20:44; 30. Ethan Gulnac, Seabury Hall, 20:45; 31. Miles Stone, Seabury Hall, 20:47; 32. Ikua Deponte, Molokai, 20:49; 33. Elisha Cullins, Kihei Charter, 20:55; 34. Nathaniel Cremer, Baldwin, 21:00; 35. Oliver Emde, Seabury Hall, 21:08; 36. Karter Kester, Molokai, 21:14; 37. Ryan Danovich, Maui High, 21:21; 38. Nainoa Kahale, Molokai, 21:22; 39. Louis John Romero, Lanai, 21:23; 40. Desmond Ige, Lanai, 21:26; 41. Elliot Tom, Baldwin, 21:27; 42. Mark Key Ambe, Lanai, 21:28; 43. Kekumu Helm, Molokai, 21:29; 44. Tristan Andre, Maui High, 21:30; 45. Kai Frostad, King Kekaulike, 21:31; 46. Caden Sconfienza, Maui High, 21:32; 47. Owen Pendergast, Lahainaluna, 21:33; 48. La’a Ponce, Baldwin, 21:34; 49. Darius Soo Hoo, Baldwin, 21:51; 50. Tristen Matsuura, Seabury Hall, 21:55; 51. Darrian Cremer, Baldwin, 21:56; 52. John Williamson, Kamehameha Maui, 21:58; 53. Hadriel Vasquez-Abarca, King Kekaulike, 21:59; 54. Aiden Rickord, Baldwin, 22:05; 55. Kaden Gittens, King Kekaulike, 22:12; 56. A.J. Alvarez, Maui High, 22:27; 57. Eddie Omine, Baldwin, 22:31; 58. Mark Brocklehurst, Seabury Hall, 22:33; 59. Kekoa Catiel, Lanai, 22:34; 60. Nathan Domingo, Maui High, 22:35; 61. Quaid Sagon, Maui High, 22:36; 62. Kazu Iinuma-Nakaaki, Seabury Hall, 22:37; 63. Nainoa Devenot, Kihei Charter, 22:38; 64. Noah Decambra, King Kekaulike, 22:49; 65. Pablo Gonzales, Baldwin, 22:50; 66. Cole Uyehara, Seabury Hall, 22:52; 67. Aden Kinoshita, Baldwin, 23:00; 68. Joel Nisperos, Lanai, 23:02; 69. Daniel Tongson, St. Anthony, 23:03; 70. Kenneth Manuel, Lanai, 23:04; 71. Daniel Graziano, Seabury Hall, 23:05; 72. Riley Satovich, Kihei Charter, 23:06; 73. Andrew Lawson, Kihei Charter, 23:07; 74. Braden Nishimoto, Seabury Hall, 23:08; 75. A.J. Pagan, Kamehameha Maui, 23:18; 76. Makia Lorenzo, King Kekaulike, 23:21; 77. Pohaku Kepler, Kihei Charter, 23:39; 78. Tekoa Torres-Umi, Molokai, 23:55; 79. Dominic Carosso, Seabury Hall, 24:18; 80. Nicholas Strand, King Kekaulike, 24:21; 81. Reymart Galano, Lahainaluna, 24:24; 82. Max Desilva, Seabury Hall, 24:28; 83. Jalen Coloma, St. Anthony, 24:29; 84. Davin Kiyabu, Baldwin, 24:37; 85. Brad Chaves, Baldwin, 24:42; 86. Nainoa Garso , Maui High, 24:56; 87. Ryder Tremble, Seabury Hall, 24:58; 88. Chase Keating, Seabury Hall, 24:59; 89. Aiden Fox, Maui High, 25:00; 90. Napana Keoho, Molokai, 25:02; 91. A. Javi Frith, Seabury Hall, 25:09; 92. Chazz Coppa, Baldwin, 25:11; 93. Kendrew Olboc, Kihei Charter, 25:28; 94. Joey Needham, Maui High, 25:29; 95. Jacob Belmonte, Maui High, 25:38; 96. Aden Johnson, Seabury Hall, 25:43; 97. Joshua Foley, Seabury Hall, 25:53; 98. Pono Birnie, Seabury Hall, 25:58; 99. Genesis Hidalgo, Maui High, 25:59; 100. D. Moana Ward, Seabury Hall, 26:03; 101. Max McKuin, Seabury Hall, 26:04; 102. Fabian Ramirez Cardenas, Lahainaluna, 26:18; 103. Robert Gibbons, Seabury Hall, 26:19; 104. Joshua Kailiehu, Kamehameha Maui, 26:29; 105. Riley Ambrose, St. Anthony, 26:48; 106. Caleb Noah Badayos, Baldwin, 27:32; 107. Jan Lloyd Simon, Lanai, 27:50; 108. Keanu Eldredge, Baldwin, 28:22; 109. Dane Ottman, King Kekaulike, 28:44; 110. Luke Mackinnon, Kihei Charter, 28:45; 111. Alex Lawson, Kihei Charter, 29:19; 112. Jerone Samari, Maui Prep, 29:24; 113. Jacob Akana, Seabury Hall, 29:35; 114. Nguyen Ronnie, St. Anthony, 30:19; 115. Nicholas Brunner, Seabury Hall, 30:24; 116. Jomel Etrata, Lanai, 30:25; 117. Jason Huynh, Seabury Hall, 34:36.